How is the aviation industry transforming in terms of passenger experience? In this article, we will spotlight some interesting components of the aviation passenger experience industry. We are writing from an MRO and overhaul or refurbishment expert perspective. How can we improve the passenger and traveling experience? What can we do to anticipate and discover solutions? Understanding our client’s needs for commercial aircraft maintenance aligns with satisfied passengers. In today’s aviation world, one could argue that airlines and airports leave much to be desired. Failed customer service experiences and limited understanding of passenger needs. In addition, not enough investment in future service models and solutions. We believe in finding solutions for our clients and in turn, bettering the overall passenger experience. The aviation industry offers numerous opportunities for sharing innovation about the passenger experience. The Passenger Experience Conference, Aircraft Interiors Expo, Passenger Technology Solutions, and many more. These events provide industry experts, including many members of our team, with an opportunity to engage with other consumers and leaders. When we engage directly with partners and the consumer, we discover ways to anticipate challenges before they even arise. Specific indicators show the future in aviation to include some incredible next-generation transport solutions. We gathered a few from the 2018 Passenger Experience Conference. Some were quite impressive: supersonic, driverless cars, electric air travel, and optionally-piloted air taxis. The technology of air travel in 2018 is evolving rapidly. The future of the industry looks very promising. From operations and innovations to improved cabin designs and better airport systems, travelers are demanding more. Good thing the industry is following suit. Passengers constantly seek lower-priced fares, simpler travel options, and airlines with convenient schedules. As you can see, there are many external factors which contribute to the overall customer experience. From our end, reducing the cost of commercial aviation maintenance happens through predictive and preventive maintenance programs. These can improve efficiencies all around and drive down costs for everyone, even the consumer. Time is a precious commodity for our clients so it is a critical aspect in terms of budgeting any projects or improvements. Holiday Wishes from Dretloh Aircraft Supply! What’s Happening in the World of Aircraft Interiors? While customer satisfaction is easily the main airline priority for 2018, this is likely to be an ongoing objective for many years. 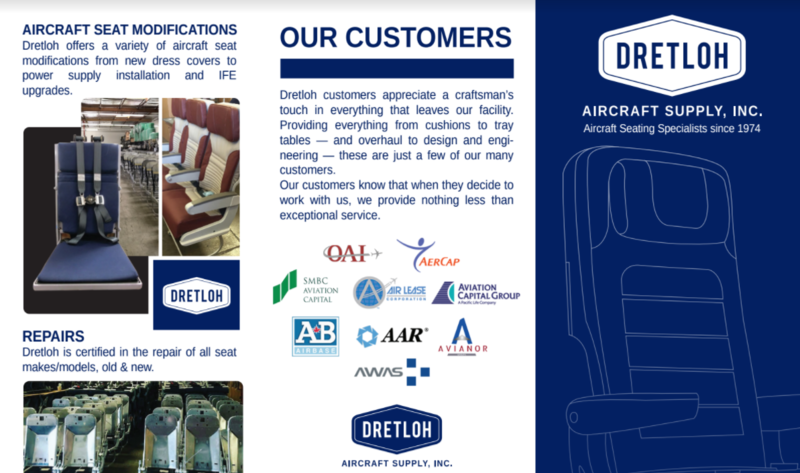 At Dretloh, we’re excited to be at the forefront of commercial MRO and overhauls. We look forward to an impressive future of enhancing onboard and passenger experiences. Have questions about our services? Submit an information request directly via our form so that our exceptional customer relations team can be in contact with you. Looking to read more about professional overhaul and refurbishment services to improve the aviation passenger experience for your passengers or clients? Read more here. 2830 E. La Cresta Ave.